Since in part one we got the Requirements and the Prototype, we will create a simple technical Document and then follow it to create our activities and the app. 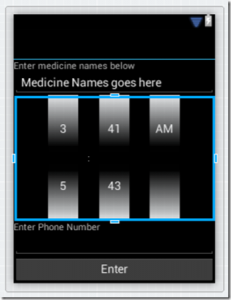 TextArea for name of medicines. This is where the user will put note down with medicine names. Auto Text will send this note content to the contact if missed. Textarea will be 100 character long. Must be able to set a specific time. this will be a phone field. We will have format. OnClick : Capture screen values and move on to the next screen. OnClick: go back to Screen 1. Save the time to start the alarm. Cancel any alarm that was set in the past. Go back to screen 1. Button for acknowledge the alarm. Keep the alarm as it. If not pressed within 2 hours, the app will send a Text to the phone number provided. Button to snooze the alarm. 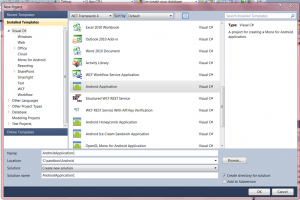 Start Visual Studio and create a new project. I am targeting Min Android 2.1, you can support other ones if you wish. This mean my min supported device will have 2.1 version of Android. 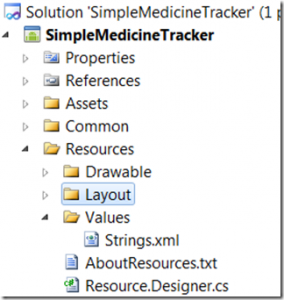 I called the project SimpleMedicineTracker. 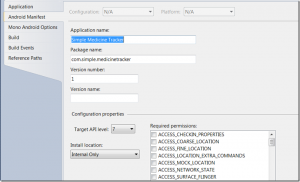 I also changed the package name to com.simple.medicinetracker and set the version to 1. API target level is 7. Change the activity name to MainPage and Layout name to Main. You need to add a label, text area, Text box, button and a label for debug purpose. Your xml file should look something like the following. Android declaration will have the button as wide as the screen and specific size. So at this point you should have a project with Main Activity in it. This is screen 1. Let’s keep this going on the next post.